This is my take on a traditional Roman recipe. I first tried it a few years back when my aunt made it for me and my mother when we visited her house just outside Rome and instantly fell in love. It is, I think, the definitive spring soup - first of the season broad beans, garden peas and artichokes, mopped up with a slice of oven-warm ciabatta and a glass of pinot grigio. 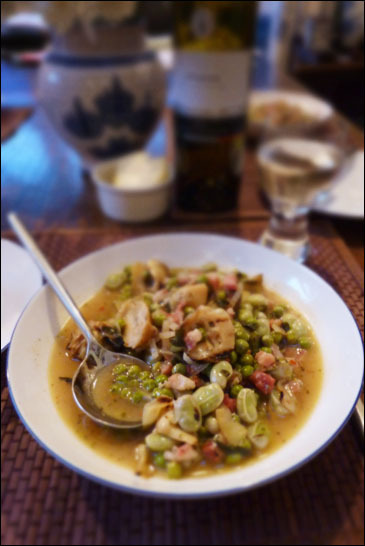 Remembering how much my mother also loved it (she, like me, loves broad beans more than anything) I decided to make it for her for Mother's Day; and it went down a treat. I am not the mother but reaped all the benefits! Not to mention the cheese and the tart afterwards!